Thanks to the Fresh Choice Nelson wine expert, Neil Hodgson for this week’s blog. It’s time to start thinking about how you’re going to celebrate the season in Nelson, and Neil has your guide to champagne and sparkling wine… Take it away Neil. It is time to celebrate Christmas in Nelson, the end of the year, the promoise of good things in the new year and of course celebrate the fact that we have family and friends to share good times with. So, it is time to take advantage of some fantastic deals The Grocer at Fresh Choice Nelson has on Champagne & sparkling wine. Wine companies know we all love to celebrate and party at this time of year, so they roll out some excellent bargains. The Grocer at Fresh Choice Nelson makes sure he has the best possible prices for you. He also makes sure there are some premium Champagnes for you as well. Not everybody’s budget runs to spending $200 on a bottle of wine, but there are some outstanding Champagnes and sparkling wines to suit every budget. As you may know by now, I am of the belief that you should drink less but drink better. So, I say spend a little more money on one or two bottles and enjoy the delights decent champagne and sparkling wine offer. The Grocer and his wine elves have a range of premium French Champagnes and outstanding New Zealand sparkling wines, all on promotion to help you celebrate no matter what your budget is. New Zealand sparkling wines offer incredible value for money with highly regarded wines like Twin Islands for $19.99 on promotion, a saving of $8. Or, enjoy a real treat from New Zealand’s original master of sparkling wine, Daniel Le Brun, with the No.1 Family Estate Assemble for $28.99, a saving of $5. The Grocer also has Champagne brands like Piper-Heidsieck, GH Mumm, Moet Chandon and Tattinger. For between $50 and $95 a bottle. If you want to try something very special, then he has a new range of ultra-premium Champagnes like the beautiful Bollinger Rose for $149, a saving of $20. Or maybe the Laurent-Perrier Cuvee Rose in a delightful cage just waiting for someone to release it, $159, a saving of $90. However you celebrate this Christmas and New Year make sure ou do it with quality bubbles shared with family and friends, and most importantly be happy and safe. Nelson Christmas Feast – Bonus recipe! This week, our Fresh Choice Nelson guest blogger, Paula, has some recipe inspiration for your Christmas feast. 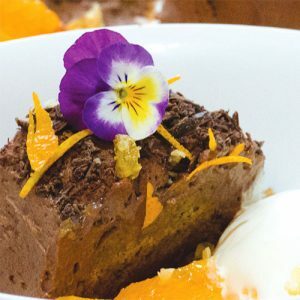 She has a delicious recipe for Chocolate Orange Tart. Take it away Paula! With Christmas just around the corner you may have started to think about what will you be serving for your special occasion festive feast. If you are anything like me then Christmas is a time of indulgence! I like to make the most of our beautiful summer Christmas and stick to making nutritional salads packed with fresh vegetables. For a special feast these can be served along with a side of smoked salmon or a glazed baked ham. Be sure to order yours from Fresh Choice Nelson for freshness and quality. Now for the sweet stuff! For many of us this is where the real Christmas feast indulgence happens. 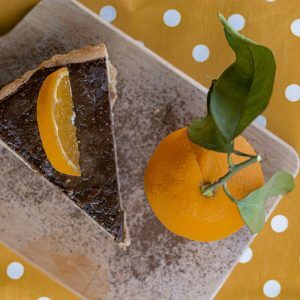 This is a recipe for a beautiful, rich, silky orange and chocolate tart, where one slice will satisfy. It is gluten and grain free and can be made sugar free, by replacing the sugar with sweetener. Mix together and press into a lined tart tin. Bake at 180 degrees until crisp around the edges, then let cool. Warm in a saucepan on the stove until silky and thick. Leave to cool slightly then stir in the butter vigourously until mixed completely through. Pour into the tart case, then cool and set in the fridge. Decorate with freeze dried mandarin slices and serve with whipped cream and fresh berries. Merry Christmas and enjoy your festive feast! 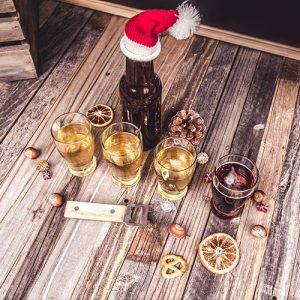 It’s beginning to taste a lot like Christmas in Nelson, and Christmas Day is a day for Crafty Christmas Brews… Plus all the other days as well! So what’s the key to pairing your festive fizz with food? There’s only one rule when it comes to a beer and food match, and that is that there are no rules. Anything goes, as long as you like the beer and you like the food. However, some flavours can be enhanced when combining different beer styles with food. Get your guests warmed up and let the good times flow with these suggested combos. Unwrap the day with a champagne breakfast, and the champagne of beers has to be La Chouffe. It’s fruity, coriander-spiced and has a champagne effervescence that lends a spritzy touch to smashed avo on toast, and all bacon and egg combos. Crafty Christmas brews aren’t just for breakfast… Seafood barby for lunch? Present yourself with a Deep Creek Undercurrent Pilsner. It’s crisp, clean and zesty, with a hint of white wine, and a finish drier than your grandmother’s kiss. At 4.5% it’s not strong enough to overpower any delicate fish flavours. 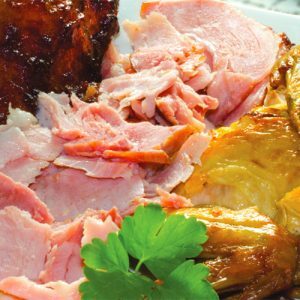 The main event… Baked ham or roast turkey? Go for Garage Project’s Red Rocks Reserve. This beer is good enough before, during or after. It smells like baked ham and pineapple, and tastes like sweet bacon. The hoppy profile cuts the meat fats, and the caramelised malts accentuate the roasty, meaty, flavours. Desserts: Funk Estate Soul Train Peach Tea with your pav. Behemoth Triple Chocolate Stout poured over ice cream. Or Kriek Boon with its cherry tones served with your trifle. To accompany Christmas cake or tarts try Chimay Blue. With notes of stewed plums, raisins and cloves, combined with rich, warming, caramel malt, this brew tastes like liquid Christmas cake. For an under the tree beer for Santa choose Mutiny on the Bounty from Garage Project. This bottled merriment is very extravagant; but hey, Christmas comes only once a year and a good brew will allow you to chill if the rellies get your tinsel in a tangle. Grab your crafty Christmas brews and fab festive food from Fresh Choice, Nelson. Wishing you a beery Christmas and hoppy new year! With many things coming to an end for the year and Christmas upon us, the gift giving season is here. It’s nice to give something special to the people you’ve appreciated throughout the year, and sometimes homemade Christmas gifts can be the kindest gesture. I think an Inspire Meal Bag would make a great gift, and if you really want to go to the extra mile, cook it for the lucky recipient. Inspire Meal Bags are a complete home cooked meal with all the ingredients you need and an easy to follow recipe card included. You’ll find them in the fresh produce department at Fresh Choice Nelson. There are lots to choose from, some bags feed two and some four people. Chocolates are also a great gift, but this amazing gluten and refined sugar free vegan fudge makes is even more special. It’s nice and dense, just like fudge, but without all the sugar. It can be enjoyed by people with gluten or dairy allergies, and because it’s sweetened by banana and berries, it makes a much healthier alternative to traditional fudge. The red and green of the berries and nuts, and the spices used in the recipe give it a Christmas feel. Invest in some boxes for your homemade Christmas gifts. Place the cashews and banana into a small handheld chopper or blender and process until completely smooth (this may take a while, but it’s worth doing until it’s smooth). 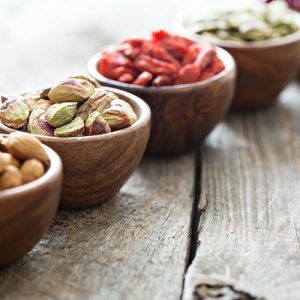 Add all the other ingredients (except the berries and pistachio nuts) and blend again, scraping down the sides to make sure everything is mixed well. Now stir through the berries and nuts. Spread the mixture into a dish of your choice (depending upon how thick you want the fudge to be) and chill in the fridge for around 1 hour (you can sprinkle over a few berries and nuts for decoration). Once set, cut into pieces and remove from the dish. Don’t forget all the ingredients for this recipe can be found at Fresh Choiuce Nelson. Christmas will soon be upon us and the season of culinary indulgence will begin. What will you be eating in terms of Christmas party food? In Europe they’ll be hoping for snow, while we’ll be plumping for sun! Down in the Southern Hemisphere we’ve continued a lot of the Northern Hemisphere Christmas traditions, from the snow on the cards, to icicle decorations at the window. However, traditional festive food can seem somewhat unseasonal. A large roast meal followed by heavy puddings on a hot, balmy summer’s day is enough to send anybody off to snooze the afternoon away. I am sure many of you have adapted your feast to better suit our climate, perhaps cold meat, more salads, or even a complete change. Whatever you choose, don’t forget to pop into Fresh choice Nelson for your roast, barbecue, side of hot smoked salmon, or even antipasto platter goodies. 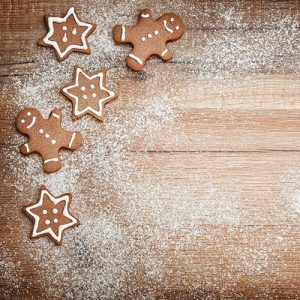 For me, there are some flavours that should always stay on the list of Christmas party food, and one of those is Gingerbread! There’s something about the smell, perhaps it stems from my time living in the U.K., but it smells like Christmas! To me, that is what sets the scene, fresh baking aromas filling the room. You can bake this dough into shapes, or even build them into a house! Sift together the flour, baking soda, ginger and cinnamon and pour into the bowl of a food processor. add the butter and blend until the mix looks like breadcrumbs. Stir in the sugar. Mix the egg and golden syrup together, add to the processor and pulse until the mixture comes together. remove, and knead briefly until smooth, wrap in clingfilm and leave to chill in the fridge for 15 minutes. Preheat the oven to 180C. line two baking trays with greaseproof paper. Roll the dough out to about 5mm thick and make whatever shapes you want. Bake for 12-15 minutes, or until lightly golden-brown. leave on the tray for 10 minutes then transfer to a cooling rack. When cooled decoaratewith royal icing. Heads up beerians, Hopgoblin is in town… Well he’s actually been here since 1982, this little hopbit is the face of Belgian beer La Chouffe, a strong ale that personifies Christmas. 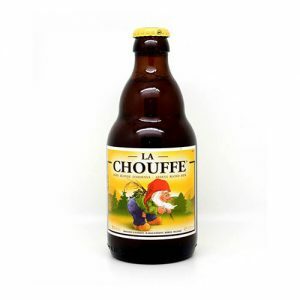 La Chouffe is the colloquial name for Brasserie d’Achouffe, a regional brewery located in the back blocks of Belgium, which was founded in 1982 by two wise men who started their brewery in a stable and produced their first born – La Chouffe. La Chouffe imparts a light fragrance of apple, orange and floral hops. It tastes of crusty bread, spicy cloves and yeast, giving a crisp refreshing festive bubbly finish. This is the beer equivalent of champagne! The metaphoric rise of La Chouffe saw the brewery biught out by Duvel Moortgat, a family owned brewery best known for its world renowned flagship beer, Duvel. This is a strong golden pale ale with flavours of dried fruits and yeasty bitterness, balanced by sweet malts and tickling carbonation all coalescing to make an extremely easy drinking 8.5%. So be careful… Duvel translates to Devil! And for your gift giving pleasure, (who doesn’t love Belgian beer? ), there is a special La Chouffe gift box, including four 330ml bottles of La Chouffe plus a special La Chouffe tulip glass featuring that cheeky little elf. Another beer personifying Christmas is Chimay, the leading brewer of the 8 genuine Trappist Monk breweries in Belgium, who have been refining their brews for the last 154 years. In 1956 this monastic brewery created a Christmas beer, now known as Chimay Blue. This liquid Christmas cake, with complex flavours of rich warming malts, stewed plums, raisins and cloves topped with a coating of almond icing. There’s a celebratory gargantuan 3 litre magnum which should be enough to please the crowd, (two people make a crowd, right?) Sip on this bad boy with caution as the 9% could give you a Parker punching wallop. Christmas will be here faster than you can say where’s the Belgian beer? So, if you’re planning a staycation then rock down to Fresh Choice, Nelson for all your Christmas do brews. Welcome back to our wine expert, Neil Hodgson, this week he’s talking champagne and bubbles! Over to you Neil! Christmas and New Year are times to celebrate, for some it is a religious celebration, for others it is a celebration that we have managed to get through another year and it is a time to reflect on what has happened during the last twelve months. 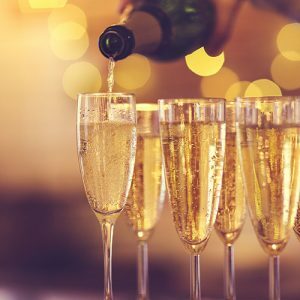 It goes without saying that a celebration deserves bubbly wines and while there are some stunning sparkling wines made in New Zealand enjoying Champagne from France seems just a little more decadent. What’s more decent champagne doesn’t cost much more than good New Zealand sparkling wines. One really good thing about champagne is that the label tells you quite a bit about the wine, something not always obvious on sparkling wine labels; the key words to look out for are Brut, which means dry, Sec which means sweet or Demi-Sec which means semi-sweet. 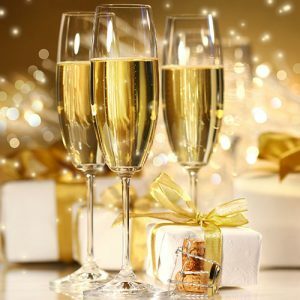 Understanding these three key descriptions will help you find a champagne that suits your tastes and make your celebration much more enjoyable, there is nothing worse than feeling you have to drink a champagne you don’t like because you paid quite a bit for it and you don’t want to waste it. When it comes to premium champagnes you sometimes pay a lot for the name because the producer may have had centuries to develop a reputation for quality, but you can also buy premium wines like Moet Chandon Brut for about $50, and H. Lanvin & Fils for less than $40, when they are on promotion at this time of year. There are a large number of smaller champagne producers selling wines direct now, rather than being contracted to one of the larger champagne houses, so keep your eyes open for some stellar deals from unknown producers. Fresh Choice Nelson has a huge range of high quality, affordable champagnes for you to celebrate with this festive season. Summer mocktails for the Nelson sober driver! It’s summertime in Nelson and with Christmas and New Year celebrations just around the corner, it’s time to think about parties and entertaining. If you have a Christmas celebration planned it’s time to look after the non-drinker or sober driver… Lack lustre lemonade, retrieved from the back of the larder, just doesn’t cut it! Thankfully at Fresh Choice Nelson you’ll find our shelves are stacked full of fresh juices, coconut waters, cordials and non-alcoholic beverages to delight and refresh your guests; our extensive selection includes those from the NZ Food Awards finalist, Soda Press Co.
Don’t forget to have plenty of ice and fresh fruit from the produce aisle on hand… Adding a slice or two of fresh, local strawberry goodness to your juices and cordials, is a sure fire way to enhance all your summer quenchers for the sober driver. 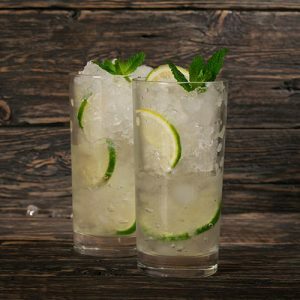 Using Press co Ginger Ale Syrup, mix 45ml with 30ml of fresh lime juice, stir together in a glass tall glass filled with ice. In a soda stream, fizz up some coconut water and then pour in over the ice (about 250ml). Stir with the syrup and serve with a straw. Using the Old Fashioned Lemonade Syrup, add 45ml of syrup and 30 fresh lime juice, stir together in a tall glass filled with ice. Top up with 100ml of cold fruit tea (I use pomegranate tea) and 100ml of cranberry juice. So don’t forget to pop down to Fresh Choice Nelson and pick up supplies, your guests will thank you for it! Your Christmas food shopping just got a whole lot easier, thanks to Fresh Choice Nelson! If you need to order your turkey, ham, duck and/or salmon, just fill out the online order form HERE. You can choose from fresh or frozen turkey, free range duck, Pestells or Freedom Farms hams, and delicious Regal salmon. You can also use the same form to order our Local Goodies Baskets, an ideal gift for clients and staff. 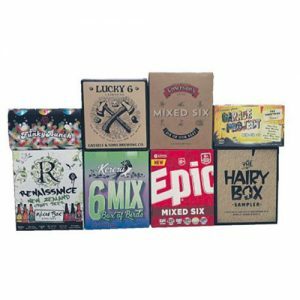 Chock full of treats from our Nelson region to tempt the taste buds, you can elect whether you include liquor in the baskets when you order. But it doesn’t stop there… If the thought of organising your Christmas Day menu sounds too much like hard work, we can help! We’ve teamed up with Paula, once again, to bring you a very special meal box filled with delicious Christmas food for you to share with your friends and family! Each Christmas Meal Box, contains the main ingredients to serve up a three course festive feast. The boxes serve 6 – 8 people, and all the recipes included are easy to follow, making Christmas lunch or dinner a breeze! 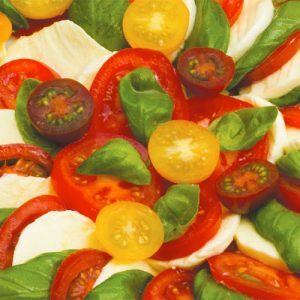 This colourful starter has all the taste of summer, with the freshest, juiciest tomatoes, creamy Mozzarella and beaut basil! Decorated Ham and Stuffed Chicken, Garden Salad with Creamy French Dressing and Christmas Couscous. Delight your guests in the traditional way with ham and stuffed chicken, we’ve added a nod to summer with some super salads for a fresh approach and this main event wouldn’t be complete without a side of potatoes! Chocolate, Ginger & Orange Log. Everybody loves the sweet stuff… And chocolate with orange is a match made in heaven! This divine dessert is sure to impress your friends and family, so much so we’d pretty much guarantee that they offer to do the washing up!